You've seen live sporting events and live concerts. Now Japan brings you the world's first “live anime,” Minarai Diva. Minarai Diva is the story of two idols in training: Ruri Aoi and Ui Harune. Over the course of each episode, they write lyrics to and even sing a newly completed song by the time it ends. Of course, the trick that makes this show stand out is that the vast majority of the anime is done live in real time. 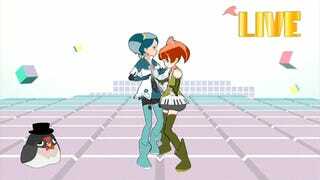 This is accomplished by using the 3D animation program MikuMikuDance (a freeware program originally designed to make Vocaloid music videos) along with motion capture of the two voice actors. While they talk and act on their small studio’s stage, they are animated in real time by the program and broadcast on both the net and TV. This creates an oddly interactive program that feels more in line with a radio show or a late night cable access show than your standard anime. The episodes begin with some lighthearted banter between the two girls before moving on to the meat of the episode: the song. After listening to the melody, the two discuss it and tell the viewers the title. Then they ask for possible lyrics from twitter and talk about some of the suggestions that have been sent in right on the air. This makes for a lot of ad-libbed comedy between the two. As the lyrics are compiled by other members of the staff, the girls (and their talking microphone) have fun doing in-character interviews and the like. Finally, to close out the episode, Ruri and Ui sing the new completed song for all to hear. The show is crazy, hectic, and a lot of fun. However, it is important to note that the entire anime isn’t done live, just most of it. Every once in a while, short, prerecorded comedic sketches of Ruri and Ui are played to give the actresses a few minutes to rest in the commercial-free program (which runs for 50 minutes). The final music video for the completed song is also pre-rendered, though the singing is done live. Taken as a whole, the presentation of Minarai Diva is very rough around the edges. Motion capture is unable to see tiny movements like that of their fingers; and their facial expressions are always a second or two late—likely due to the animators taking that long to manually change them. Moreover, watching as the girls try to interact with objects and characters that aren’t physically there is hilarious in how bad it looks. All that said, however, Minarai Diva remains a novel idea and an enjoyable watch. It is an interesting experiment that comes off amazingly genuine and heartfelt. And as a first step, it opens up a myriad of possibilities for the industry. Who knows, doing an anime live (or at least doing one animated via the motion capture of the voice actors) might turn out to be the future of anime. We'll just have to wait and see. Minarai Diva airs on Tokyo MX in Japan. There is currently no word on any sort of Western release though it can be watched for free in raw Japanese (i.e., Japanese voices with no subtitles) on NicoNicoDouga.